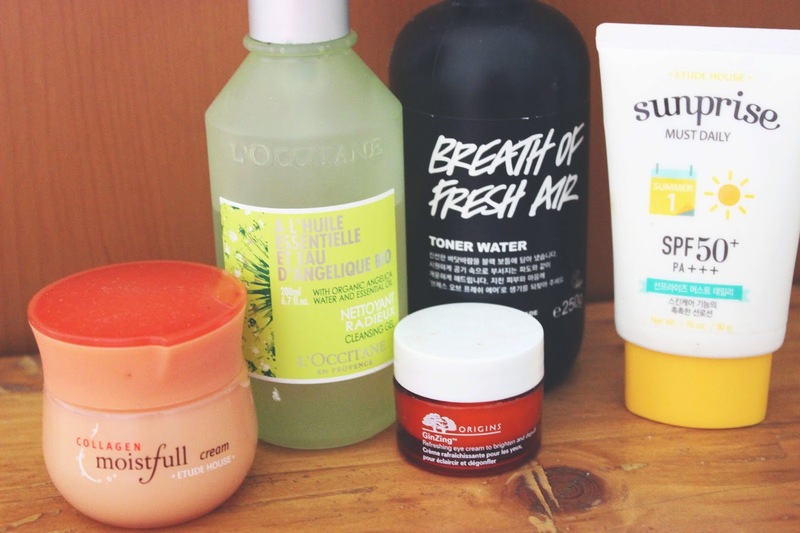 I change my skincare routine quite frequently because I like trying out new products. But for now, these are the products that I'm using pretty much everyday. I bought this by accident because I originally planned to repurchase The Body Shop Seaweed Cleansing Gel, but they didn't have any stock. It was a good kind of accident, though, because I ended up loving it. I didn't do any prior research on the product and was looking for something hydrating since my skin was so dehydrated (but oily) at the time, and the lady recommended this so I took this one. On days when I forget to put on moisturizer, this contributes in keeping my skin moist and supple. My skin has improved so much since I started using this product which I'm all for. It has a minty-grass scent which I don't mind. It's a little more pricey than previous cleansing gels I use but definitely worth the money! This comes in a very big bottle so it will last you a long time. I asked the guy for something super hydrating and he recommended me this one. I saw people have not been loving this because it makes your face proper wet instead of mist coming out of the nozzle, but I love it because it wakes you up and totally freshens your face. I put 5 spritzes all over my face in each use and wait for it to dry. It does tighten your face a little bit, though, so keep that in mind. The guy also told me you can spray it on a cotton pad and then wipe it on your face, but I haven't tried that method. So far I'm enjoying this product but once it runs out I don't think I'm going to repurchase. I bought this just thinking that I needed a day cream without reading reviews or knowing how it works (everything was in Korean). I tried the tester on my hand, I loved the texture and the name kind of got me so I bought it. It's nothing like I've tried before you can feel that it contains a lot of water. It's very smooth but not runny. A little bit goes a long way. They also give you a spatula to get the product out so it's more hygienic than putting your finger in the tub. I find that it works really well under make up and it's definitely moisturizing. It absorbs to your skin in seconds and you can instantly feel your skin is nourished. This was raved by a lot of beauty gurus a couple of years ago, but I only had the chance to try it out this year. This is so expensive for me so although it works, once it runs out I'll look for an alternative (I have an unopened tub of Etude firming eye cream!). I also find that this needs to set for a couple of minutes before you put make up on top, because it has the tendency to slide around so your make up looks uneven. Is it brightening? Yes. Does it shorten the life of your make up? No. I can see why this was such a cult product but it's not as fantastic as I thought it would be. It can last you forever though because you only need a small amount of product for each application. The packaging was really cute and I ran out of my sunscreen so I bought it. It's just a regular sun screen. It has a pleasant smell and nice consistency. It tends to make your face more oily, though, as a lot of sunscreens do (and maybe because of the high SPF). It does not break me out so that's positive. Not repurchasing. So guys! What have you been loving? Is there something I should try? Have you tried some of the products from my routine? Let's be girl friends and discuss these things!